Brazilian Bruno Vilardi is a self-professed Kylie Minogue addict. Bruno is so enamored with the Australian pop singer/actress that he has devoted an entire paper toy web site to nothing but dolls of Kylie. Each doll is dressed in a different costume from one of Minogue's numerous music videos and movies. Several dozen dolls have been created so far. My fave is the Kylie doll in the Green (Absinthe) Fairy costume she wore in a cameo appearance in the movie Moulin Rouge. Check out Bruno's web site here. Just click on the picture of the doll to get the template. UPDATE 10/22/14: The dolls pictured above are apparently no longer available. 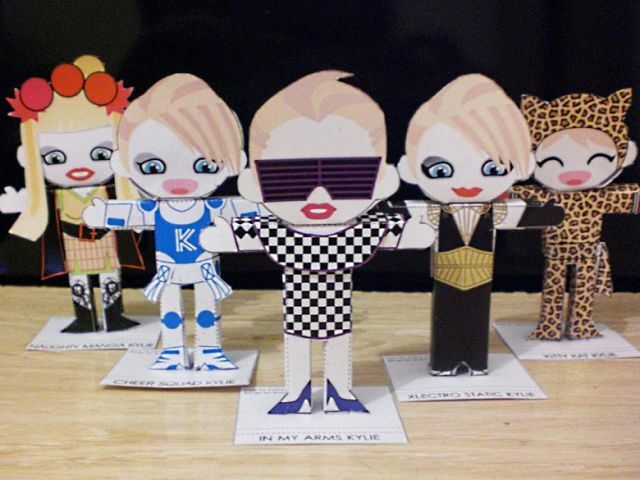 The link in the post above has been redirected to Bruno's new website where he offers a different style of Kylie paper doll. Eisbrecher is a German industrial metal band. 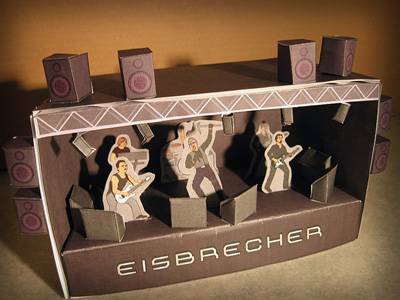 Eisbrecher also happens to be the favorite musical group of Eka from Finland, the creator of this papercraft theater (or should I call it a "papercraft stage"?) Eka drew the band members by hand, then translated them into an electronic format that could be turned into papercraft. Not bad for a first attempt at papercraft design. A download of the template is available here. Pterosaurs are the earliest known vertebrates to have the ability of powered flight. The word "pterosaur" literally means "winged lizard". 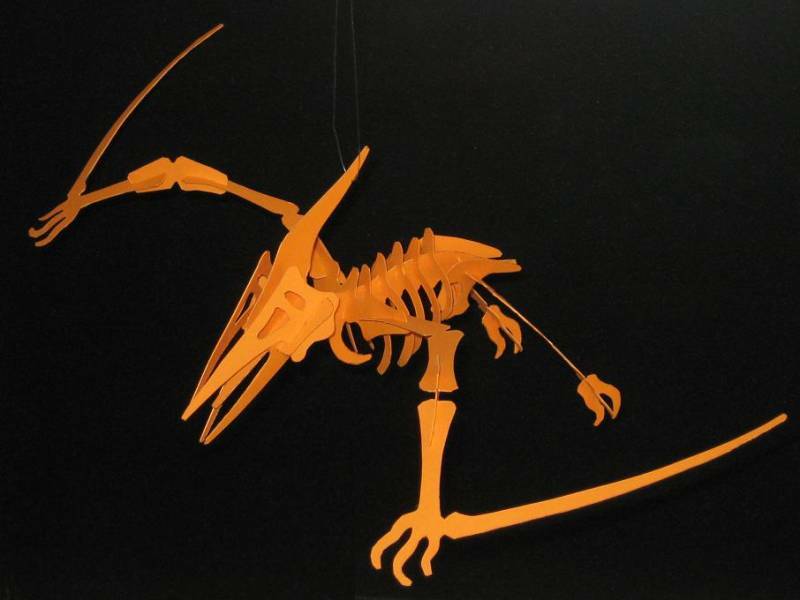 This papercraft version of a pterosaur skeleton was created by Italian papercrafter Emiliano Capuzzo. The template for this papercraft was based on a 3D plywood puzzle. A PDF file of the template may be downloaded here by clicking on the word "Pterosauro" just above the first photo on the page. Papercrafter Dave Winfield has an amazing collection of Hot Wheels scale papercraft cars available for download on his website. In addition to papercraft recreations of actual Hot Wheels toy cars from the the late 60's, Dave also offers small scale papercraft cars from movies and television. 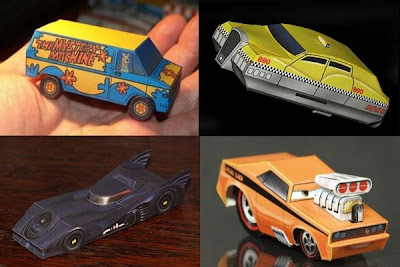 Pictured above (starting in the upper left and moving clockwise) are the Mystery Machine van from the Scooby Doo television show, Korben Dallas' flying taxi from the science fiction movie The Fifth Element, Snot Rod from the Disney Pixar movie Cars, and finally the Batmobile from the 1989 Batman movie. Templates for all the cars mentioned above are available here. 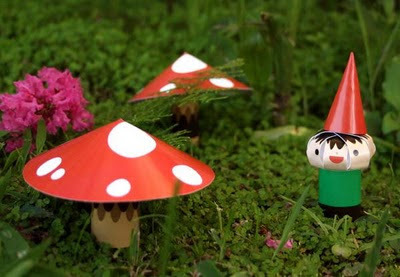 strips of paper is used for the gnome's head. The Capcom character Zangief first appeared in the 1991 Street Fighter II video game. Zangief is a underhanded professional wrestler from Russia who's training method involves wrestling bears. 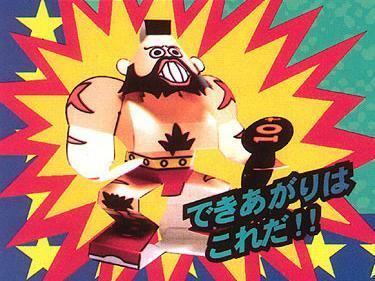 This simple four piece papercraft of Zangrief was likely a Japanese promotional item related to one of the many Street Fighter video games. A scan of the template is available from the Game&Graphics blog here. Here's another great architecture papercraft from Pepachal. 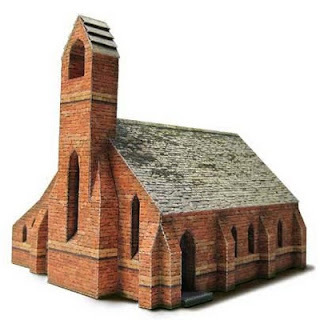 The text with this paper building describes it as being a "creepy" church in rural Yorkshire, England, but I am guessing that the building is fictional. The deeply recessed windows and the use of photorealistic textures on this paper model give it a nice solid feel. The template with instructions in PDF format is available here. UPDATE 3/17/15: There has been a change at Pepachal. Only the most current model in the series is free. The older models (which includes the churches mentioned above) must now be purchased. 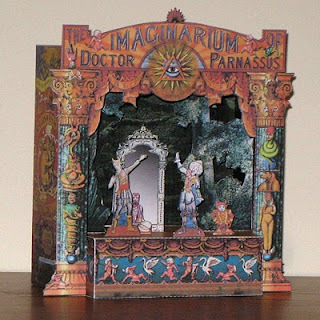 The photo shown above doesn't do justice to the 3D effect of the theater which is similar to 3D decoupage. I hope you enjoy the theater. It was a lot of fun to design and build. Oh, I forgot to mention the model comes with a "curtain" and there are slots in the top so that it may be used as a functional toy theater and not just as a prop for a book shelf. The Ford 3-Ton M1918 was one of but a handful of tank models that the US produced during World War I. The tank carried a two man crew, could travel at a whopping 8 mph, and was armed with a single machine gun. This papercraft version of the Ford 3-Ton, created by Joseph A. Golden, is intended to recall the paper toys that were printed on the backs of cereal boxes in days gone by. This tank is available here. 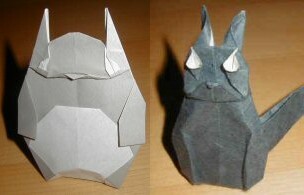 Here is some wonderfully creative origami by UK artist Robin Glynn. Both are characters from animated films by Studio Ghibli. On the left is an origami totoro from My Neighbor Totoro. On the right is the cat Gigi from the film, Kiki's Delivery Service. Folding diagrams are available for both the characters. A link to the diagram for the totoro may be found at the bottom of the page here. A link for the diagram for Gigi may be found at the top of the page here. 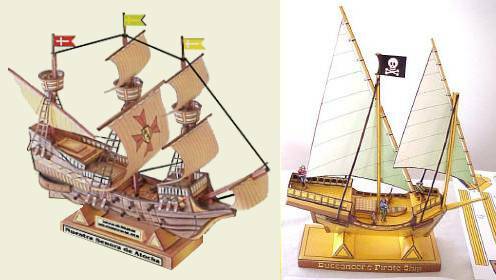 These two sailing ship papercraft were created by the Atocha Treasure Company. On the left is the Spanish galleon Nuetstra Senora De Atocha which sank in a hurricane off the coast of Florida in 1622. Modern treasure hunters were able to locate the wreckage and salvage the Atocha's treasure in 1985. On the right is a generic model of a buccaneer pirate ship from the same time period as the Atocha. A low-res sample template for the galleon is posted here while a low-res sample template for the pirate ship is posted here. Pre-printed, high resolution templates may be ordered from the ATC for a price. UPDATE 3/1/2015: Pre-printed hi-res templates are no longer offered by ATC. 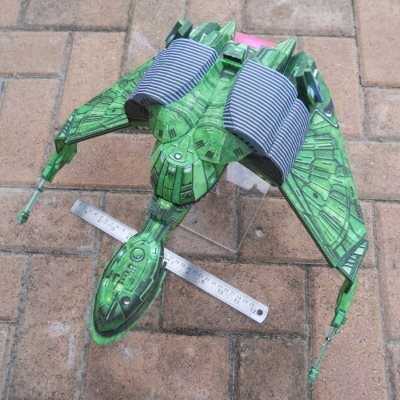 In fact, the ATC paper model website no longer exists. 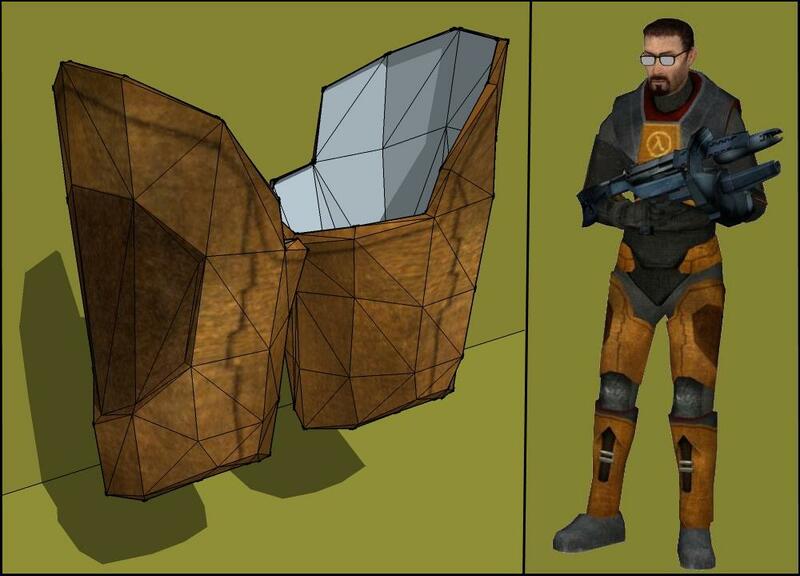 The links to the low-res versions now point to alternate locations where images of the templates have been preserved.